Gout used to be associated with the high life, believed to be most common among men who could afford to eat and drink too much of the best of everything. It is now known that people with gout, the most common type of inflammatory arthritis in men over 40, have a "metabolic glitch" that allows the uric acid in their bloodstreams to rise to damaging levels, says Harvard Medical School. Some people swear that wrapping cabbage leaves around gout-affected joints eases pain, but home remedies notwithstanding, scientific evidence has been mounting that cabbage may be the gout-stricken man's best friend in the vegetable kingdom. The standard treatment for gout involves anti-inflammatory drugs in combination with a diet low in purines, the chemical compounds that lead to crystals in and around joints to cause the agonizing pain associated with this condition. A study published in the June 2005 issue of "Arthritis & Rheumatism" found that 500 mg a day of vitamin C significantly lowered uric acid levels in 184 participants. The researchers concluded that vitamin C might be beneficial in both preventing gout and managing symptoms, findings supported by a later study, published in the March 2006 "Archives of Internal Medicine," involving 47,000 participants who were followed for 20 years. After analyzing nutritional data from the U.S. Department of Agriculture, Best Gout Remedies concluded that red cabbage contains substantially more gout-fighting properties than its green counterpart. The alkalinity of both will help to neutralize uric acid, but red cabbage offers the added benefits of the flavonoid that gives it color, cyanidin. This chemical, also found in sweet cherries, is believed to protect against gout attacks by helping to reduce uric acid levels. Moreover, red cabbage is higher in vitamin C than both green cabbage or cherries, a fruit often touted for anti-gout properties. 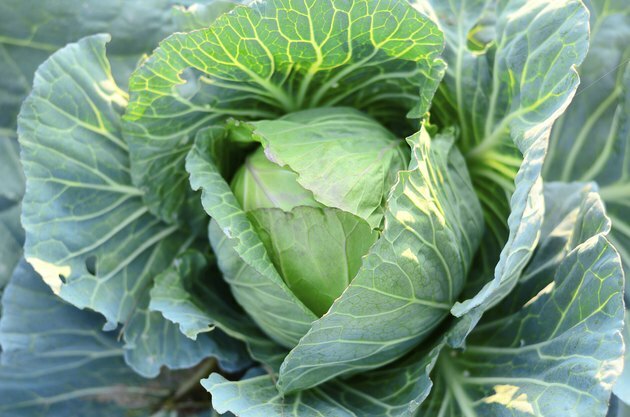 The Linus Pauling Institute gives cabbage and its cousins in the cruciferous family, including broccoli, cauliflower, brussels sprouts, kale, collard greens, mustard and bok choy, high praise for their disease-fighting capabilities. The beauty of this simple home remedy is that the cost of trying it is negligible -- and many gout sufferers claim it reduces or eliminates pain. Keep a few frozen cabbage leaves in a plastic bag in the freezer. When gout strikes, take them out, arrange them around the affected area, wrap a towel around them and let the warmth of your skin thaw them naturally. If the theory is accurate, the gout-fighting chemicals in the cabbage will penetrate the skin and dissolve crystal deposits. If not, the frozen leaves will soothe the inflamed area anyway. Cabbage is an ancient vegetable grown all over the world so a veritable United Nations of recipes for adding more of it to your diet are only a mouse click away. Some nutrients are lost in cooking, so eating the vegetable raw, in slaws or cabbage salads, is the best way to get maximum anti-gout benefits. Other tasty ways to make cabbage go down easy include Russian borscht, Polish cabbage rolls, Chinese stir-fry, German rotkohl and Indian vegetable curries.